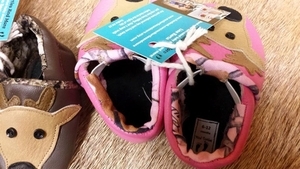 Hand - made, soft - soled baby shoes! 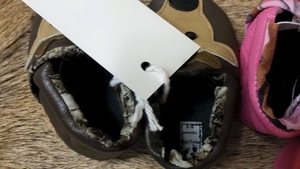 These are so comfortable our little baby Blake Kenard Kreycik loved his so much he never took them off. 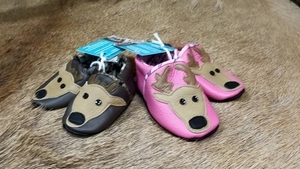 Of course these adorable little shoes have none other than the majestic elk featured on the top. Available in pink or brown, sizes 3-6 mo, 6-12 mo & 12-18 month.